Yeppa! Today I registered my first bower package, ng-upload-window, an angularjs directive wrapped around Danial Farid's ng-file-upload upload service, which organizes uploads inside a layer window which remembers the google drive upload window. You can find all relevant information and installation instructions in the github project page. 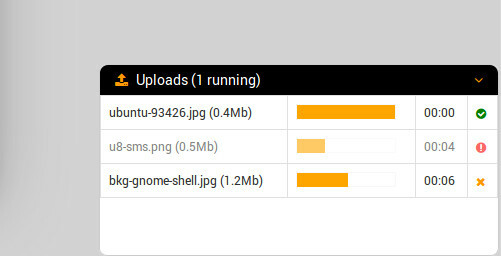 for each upload information are shown: file name, file size, progress bar, the downloading remaining time and the status of the upload. the window can be closed when there are no more running uploads, or it's automatically closed after 8 seconds. A long time has passed since my last post, I was fighting hard with a project learning django REST framework and angularjs, and now time has come to share some interesting knowledges. This entry talks about serving private media from a django REST webservice, developed with django REST framework, to angularjs, in a scenario which uses a token authentication schema and CORS requests. Let's see the problems we have to deal with.